Great to hear that Yoshimaru-san and Rica-san's trip to Guatemala was asuccess. I am happy to let you know that Dave opened the box of clay figures inside the Turtle Lodge, and we were so pleased, excited and overwhelmed by them. We placed them in the different directions as per Yoshimaru's instructions and have been sharing their significance and the story of them with all that enter the Turtle Lodge. We are very grateful for the support they are bringing to the work we are doing. We keep you all in our thoughts and prayers. Thank you for this precious gift. Since 2004, I have been working on projects in conjunction with the Japanese Aerospace Agency (JAXA), a space centre that has been in operation since the 1960s. Based on the island of Tanegashima - located in southern Japan where the East China Sea and the Pacific Ocean merge - the space centre is adjacent to the active volcano Sakurajima which lies at the tip of Osumi Peninsula. The volcano too was once an island but after an eruption in 1914, it is now connected to the mainland. After witnessing the oil/gas drilling incident in Porong, East Java (the focus of my video installation HAVOC, presented at the Venice Biennale in 2007), I imagined that a sense of humanity would begin to inform resource exploration and technology - especially in the wake of catastrophic consequences - and, in turn, address issues of exploitation and the precarious balance between the increased demand for natural resources and the plight of indigenous peoples in areas of excavation. Recent satellites launched from Tanegashima have been specifically designed to monitor world weather patterns, environmental disasters (man-made and natural), greenhouse gases, security networks, defense systems and other communication satellites. Working in collaboration with Japanese specialists, my projects - in light of the recent environmental and humanitarian disasters - suggest there are many indicators and forewarnings that should be changing the ways we think about the world. Strangely - and almost daily - the supernatural, elemental forces of nature seem to be demanding this seismic shift from humans. Born 1953, Sydney New SouthWales. Lives and works in Sydney. photography and painting. Her recent projects have focused on intercultural issues. Norrie was one of three artists representing Australia at the 52nd Venice Biennale, 2007. In the last 20years she has developed a practice that sees and uses art as a tool for political commentary. The environment, man-made and natural disasters have informed her projects. Recently she has been working in Japan documenting　the environmental satellites that are launched from the Japanese Aerospace　Center on the Island of Tanegashima. I bring you all Greetings from the sacred lodges of my People, the Anishnabe – we come from what our people refer to as the center of Turtle Island: America. We have a very sacred site known to our People as Manito Api – “Where the Great Spirit Sat”. It is from the sacred site we have evolved with prophecies, visions, laws and teachings that reflect our connection to Spirit and this deep love of the Earth that we have. At this present time, I am writing these words in front of a Sacred Fire that has been lit for a lodge and ceremony called the Mother Earth Lodge. It is a lodge that honours woman, mothers and Mother Earth. The Dreamers of our people have confirmed we have entered a time when a New Life is arriving. As this New Life arrives, the Earth will use its natural forces to cleanse the Earth and stop what has been destroying her. If we as humans are going to survive we must reconnect and align ourselves with Spirit and the Land. Just recently we supported rites of passage for the young boys and the young girls as they made the transition into adulthood. A message came out of the Vision Quest that the young boys went on, as they were brought back to the sacred lands of Manito Api to receive the vision for their life through prayer and fasting. Man has dishonoured woman; rather than support the gift that the woman has, he has attempted to destroy it with his greed. When all the men were sitting together to hear the messages that were brought by the ones that went out on the Vision Quest, their faces dropped; it was a wakeup call. The men returned from the sacred lands to the Turtle Lodge, one of our sacred lodges, where the young girls had been going through their rite of passage in becoming women. As the men returned, the women greeted them and honoured them, despite all that has been done to woman, by welcoming them back into the lodge, which to our People represents the woman. We need to support rites of passage that will help the young people to become leaders – to become the real agents of change – the initiates reflecting the New Life. Making a journey to Mt. 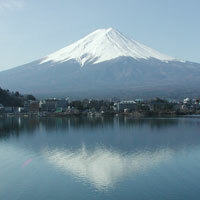 Fuji – climbing the mountain – is a metaphor for making the journey to a higher level of living. Climbing to the top of the mountain allows us to have greater vision. The higher you go the more you see. We cannot continue to use energies or technologies that are unsafe and that have the potential to destroy life. We have to come to terms with what this New Life on Earth will require. We have to come to terms with how we have been treating the Earth. In order to support this New Life that is arriving, we have to be prepared for a much simpler, more sustainable way of living without using technologies and energies that threaten the Earth and our lives. As the human family, in order to ensure a world that has peace, we must begin by putting the children back into the center of our lives. And we must be prepared to protect the rights that all children are born with. Every child is born with the right to have clean water, clean air, and all that it would need in order to have a good life and a good future. Every child is born with the right to be loved. Every child is born with the right to be told the truth. Every child is born with the right to have a good mother and a good father. I am in full support of your journey to Mt. Fuji because it represents all our journeys in seeking peace. We will find peace when we find it in ourselves – when we reach the spirit of our hearts. We must support each other as we join in the collective, supporting a vision that brings us together without relinquishing our individual identities. I realize that the People of Japan are facing incredible challenges because of recent events. It will require a strong spirit of determination and perseverance in maintaining a spiritual connection and a continued reliance on the Earth to provide what we need to live, including the Mother’s love and connection that she brings to us. We will continue to offer our support with continued offerings and prayer to the Spirit to intervene on our behalf. As Indigenous Peoples we have always relied on the lodges and the ceremonies that we have evolved with as an ancient People. We remain committed and faithful to the power of Spirit – Spirit to our People has always been reflected in Nature and in the land. It is our connection to the Spirit that will ensure our survival and future. I just spoke with Grandmother Rita Blumenstein in Alaska and she wanted me to let you know that she is currently developing a medicine for radiation sickness with a doctor and several students. They are making a tincture from kelp. She will let me know if it will be appropriate for you to contact the doctor directly. We will keep you informed. I am so happy to learn that you are going to organize a great ceremony in Mount Fuji on June 18th 2011. To provide the power and shakti to bring changes of minds of the beurocracy, government and tachnology not to produce atomic things whic has been damaging several places such as Bhopal in India, Chernobyl (ex-USSR and Russia now) and recently in Japan. All the rich and powerful nation must closedown this kind of products immediately. Om Shanti, Om Shanti, Om Shanti..
We are belonging to the big family of life on Earth. Our family needs us human beings. Our brothers and sisters, the stones, plants, animal, the fire, water and wind they need our human spirit. There are things only human beings can give, like our music, our arts, our good thoughts, our conscious decision for “the Good”, our recognition of love, of being loved. In 2007, we had this ceremony on Volcano Stromboli in the Mediterranean Sea. We received powerful signs that the medicine we have given in the volcano – a golden bowl – was accepted and can now unfold its healing. It is said that the water on Earth came from the countless eruptions including water vapor from the volcanos in the Earth’s early time. Thus, the Volcanos gave birth to the big waters, where all our lives begun. It is good to go there again and remember the immemorial past of all of us. It is good to pray there. On Saturday, 18th we will be with a circle of about 30 people and lead by our elders – Hugo-Bert and Inge Eichmüller – at our site in Cana, Toscany. At our “Biotope of Humaneness”. We will just have finished a time of fasting, contemplation and listening of 1 week. It is the same site to where we would like to invite you to come for our Spirit Vision Dance in early August this year. Also I would very much like to ask your support for our “Music for Life” concert at the next conference for biodiversity in New-Delhi in October 2012. Our goal there is to bring music inside the conference venue – as medicine. Please spread this, send this information to anyone you think could be interested to know about this. We need lots of help to realize this vision. We need people in India to help us. We need financial support to pay the costs of the musicians. We need people that follow this vision with their hearts and who wish us success. We want to give an impulse of hope and power for the love of human beings towards our relatives, the plants and animals. Nowhere on earth is the temperature rising as quickly as it is in Greenland. Since the 1980’s, the average near-surface air temperature has generally increased by three degrees Celsius. In the meantime, the ice has melted so much so, that fire can once again be made with local Greenlandic wood. However, according to the well-known Eskimo Shaman Angaangaq Angakkorsuaq, the ice has actually been increasing someplace else—in the hearts of man. In order to counteract man’s escalating complacency, Angaangaq, together with other Shamans from around the world, held a Fire Ceremony in July of 2009. Photographer Sven Nieder, together with author Angela Babel, documented this special gathering at the northernmost point of the earth in a coffee-table book. “One day, when the world needs it most, the Sacred Fire will return to the people of the high north.” Climate change seems to have made this ancient Greenlandic prophecy come true. Where, for ages, there was only ice, bushes and trees are once again growing. Each and every day, twenty centimeters of the island’s ice melts away. Local animal’s hunting behaviors have been seriously affected. In order to survive, polar bears have actually been eating one another. “Earthquakes, Tsunamis, hurricanes…our earth is sending us alarm signals because she is sick and needs help! But we turn a deaf ear and look the other way, pretending not to hear or to see,” says Mandaza Augustine Kandemwa from Zimbabwe. There is no longer any doubt that the inhabitants of the earth will have to adapt themselves to new climate conditions. The Amazon Region will eventually disappear due to the ice-melt. Sven Nieder’s photos capture the vast expanse of the Greenlandic landscape. In portraits of the Elders, he documents their deep concern over the earth’s alarming condition. Angela Babel’s text complements the photos with a consolidated and touching description of the course of events during the Shamanic Ceremony. The book comes full circle with a greeting from Angaangaq Angakkorsuaq and an essay from author Dr. Christoph Quarch. Shaman Rica Higa from Japan is thirty-eight, lives in Okinawa and regularly travels through her home country with her husband, Yoshimaru, also a shaman, to say prayers and hold ceremonies at specifically selected sites. ‘With our prayers and our ceremonies, we hope to restore the world to its equilibrium again. We travel to the coasts, to the mountains and the lakes – but mostly, to atomic power stations. The reason for that is that Yoshimaru once had a revelation – that a natural disaster will set off an accident at a nuclear power plant which in turn will have unimaginable political and economic changes in its wake and that these will ultimately lead to a third world war. We pray that this does not happen. We pray so that people wake up and recognise the dangers that they themselves have invoked. We pray to the gods that no disaster might occur. We pray that they might protect us until we are in a position to ward off this danger ourselves. And then we tell of what we experience at ceremonies in other countries and how people on other continents become involved for a restoration of the balance of our world. We are only at the beginning and our audience is growing only slowly. But we believe that we are working for a better world. “For our circle the new year is a year of new beginning. We hope that soon we can meet more often and more in depth with people who sincerely care for life on Earth. We wish to all of you around this beautiful home planet a year in which you can understand how you can contribute to the evolution of humaneness. We wish that you find many, many people with whom to share the good and bad moments, thoughts, prayers, songs, food and drink, sunshine, rain and all other things that nourish our body, soul, mind and spirit. May you be healthy and protected and understand the blessings that surround all of us. Hello Yoshimaru and Rica Higa and friends in Japan. Greetings from Guatemala and a Happy New Year to you, may all your dreams come true in the New Year. The year is gone and we were not able to do the gathering here in Guatemala as we wanted. I have doubts if 2011 will be different, the money the President had assigned for the gathering had to be used for fixing the roads after the heavy winter. We had one of the volcanoes close to the capital city erupting and close the airport for 10 days, it caused a lot of cleanup work, then we had 2 hurricanes, and 7 months of rain, that caused a lot of damage to the roads. Let's see what the New Year brings.